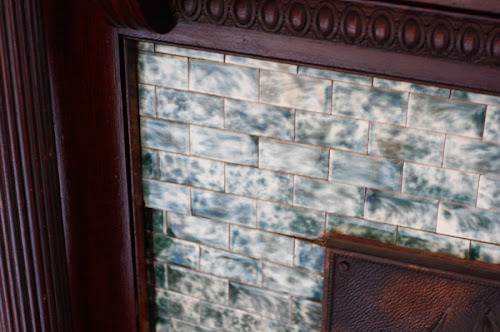 Here's a closer look at the Rookwood fireplace tile I'm debating, as seen in yesterday's photo. I thought about decorating the room to go with it, but couldn't bring myself to decorate around something I don't particularly like. Does anybody else see spinach dip here? It's also a bit cracked and chipped. At first I hated it. Then it started growing on me, and now I just mildly dislike it. Maybe I'll leave it alone and add some green artwork or something to tie everything together. I would just ignore it. It looks original to the house so I'd hate for you to remove it. I think you'd find it won't stand out at all however you decide to decorate around it. I had an old house and the tiles like this were painted but I would have loved for them not to be painted over, whatever color they turned out to be. They say green is a neutral anyway, whoever "they" are. Well, if you do decide to get rid of it, just save it for the next owners. I'm sure if you cleaned it up very well and put it away safely, the next owners would be delighted--if they wanted to reinstall it. I wonder; my fireplace has just 3 large slabs of raw slate (plus one large one for the floor). Would something like that fit over your tile without damaging it? The sides are a little bowed, but I would love for that to work! The idea of hiding it temporarily is attractive. The work of removing the tiles so that someone else can enjoy them might actually be better than you having to work to enjoy them yourself. Of course you could probably cover it with some thin stone pieces. I laughed when i read your dilemma. I live in the 'Nati and a Rookwood fireplace is a HUGE selling point for any home in this area. The thought of removing it would send many here into shock. For that reason alone, I would be hesitant to remove it. Can you cover it with a facade? Newport is lovely. Welcome to the area. A little wacky but who knows, maybe it'd work? Thanks! Since I'm not painting over the woodwork, folks didn't have a chance to freak out, so I'm glad I raised the tile issue to keep it interesting around here. Oops, that reply was for Anonymous 1. Anonymous 2, I will check out that link! What about some sort of pressed tin (like the ceilings) either painted or not, to cover the tile as an insert? I would also say either leave it and add green to the room to find some way to live with it. I agree that a good cleaning and re-grouting might help brighten it. Or possibly use a thin tile on a piece of concrete board that could be inserted over the tile without damaging it? It might just be my "eclectic" taste, but I think these tiles are lovely! How could you bring yourself to get rid of these! The black areas are chipped off and damaged, but maybe I could clean up the grout. The tin tiles idea is very intriguing to me, too! Anyhow...you will make it work! I could go for some roquefort tiles and a glass of wine right now, as a matter of fact. Remove them and use tiles you love. Make out of removed Rookwood tiles art into your dining room wall. I agree with the other posters who say keep the tiles. We as a nation are too quick to destroy what is unique in favor of what we perceive as "perfect" or new. Your beautiful new curtains do a lot to pull the room together and your tiles look lovely against the dark wood. My sister-in-law, the painter, likes to point out that snow isn't just white, there are pinks and blues as well as various shades of white in it. From the photos, it looks like your spinach dip might not be just green either. Perhaps there is a color in it you find more livable that you could run with and downplay the rest. I think I am in the minority here. The hearth tiles are in terrible shape. Plus the green really doesn't go with the fuscia and blue you want the room to be. You just moved into this house and I assume plan to be there for a while. If it is only for a couple of years then maybe leave the tiles undisturbed for a potential buyer. But if you plan to be there for more time, make it a place you will love. It just doesn't seem like the color is something you love and will be hard to work into your preferred color scheme. 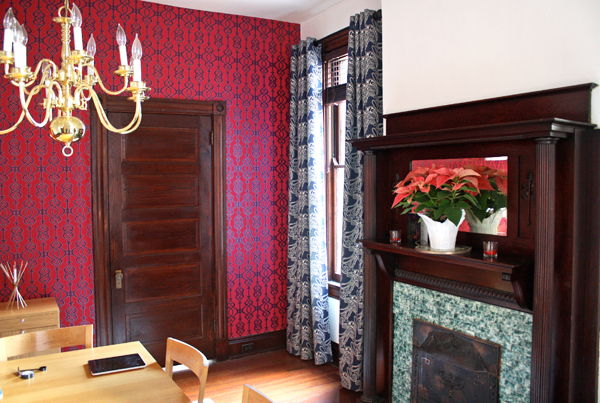 In addition to the conflicting color, the design of the tiles conflicts with the wallpaper and curtain. It is really busy looking. Be ok with letting them go regardless if they are original, it is your home now. I do think some of the ideas like a tin tile or thin board that you could attach over and paint, etc would be worth trying before you make a more permanent coverup. oh, sigh. i like them even better up close! but i agree with both sides here. i know all too well what it feels like to have 'unfinished business' with your dwellings and the annoyance that comes with that, so you shouldn't keep it just to please 'them' but by all means let someone else have the tiling if you do deside to get rid of it. Is it a working fireplace? If it's not, there would be tons of ways to cover up the tile damage-free (even sticky-back vinyl, or fabric). Even with a working fireplace, I feel that there should be a way to cover the tile - wholly or partially - without causing any damage. I'm torn here... I'm a lover of old/original things and I'm one who always cringes at painted wood, etc., but those tiles aren't my taste at all. My eyes say take them away but my soul says you can't do it :) Good luck finding a solution, I'm sure you'll come up with something. And thanks for letting us decorate vicariously! Maybe it doesn't look the same in person, but it reminds me of a stormy sky. You know how the clouds swirl and get dark and a bit green. It's interesting. Before doing anything drastic with the tile, why not share your photos with the Rookwood Pottery staff at their new store located (across the river) in Over-the-Rhine? Who knows, a consultation may lead to a better understanding of the work few local homes possess. And...if you were to rid the room of the tiles, the RP store just may provide a buyer list for the material. Have you thought about a non permanent solution. Like peel and stick laminate. or even contact paper. I wonder if those wall decals that they make that you can remove would work. I've also seen peel and stick wall paper like the wall decals but with more coverage. I like all of the temporary cover-up suggestions. But, until then I think you should serve spinach dip at all of your dinner parties to tie the room together. Great idea. I'll just keep a bowl on the table at all times. I have to say I don't like the current motive of the tiles neither and this is not related if they match with the room or not. Plus they are pretty damaged. At the same time I have the idea that if you replace them the best would be to choose not just nice looking tiles...It cannot be just a casual fireplace, it must have character! 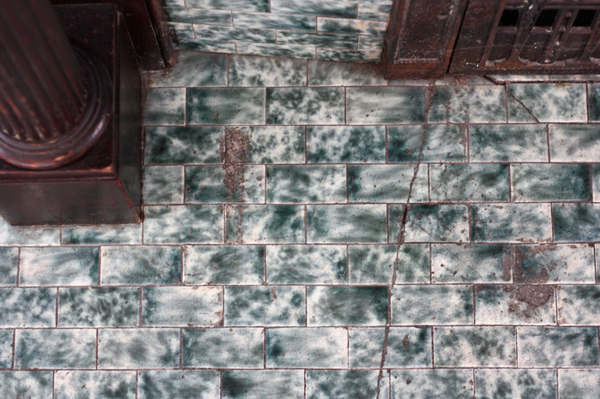 But not sure: you don't like Rookwood tiles at all? Are they too expensive? I say, no sacred cows! Do what make you happy! Oooo, interesting! The end results looks so pretty and fresh! Daniela, thanks for the catalog! I really like the modern classics section. I had no idea they make anything like that. Do you own the house? You could always remove it (SUPER carefully), sell it at auction (Rookwood collectors are serious, you'd prob. do great), and put in something you really like. No sense living w/something you dislike just because it's famous. I think it's so pretty! It's not very often one sees fireplaces built using marble. Your house is old and I like how you put a modern twist on its traditional design.